7 Days to Die Review - Can Plant Fiber Save The World? 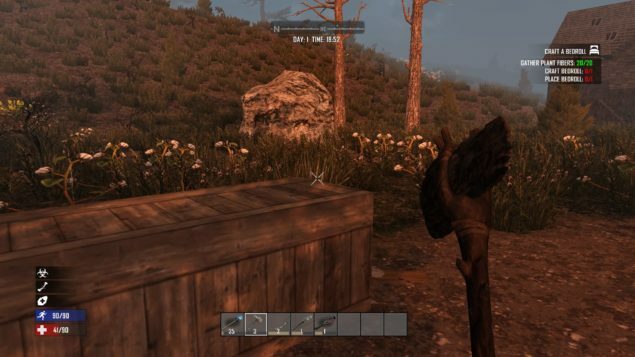 7 Days to Die Review – Can Plant Fiber Save The World? On a very strange day, you find yourself in the middle of nowhere, with no sign of civilization outside ruins. You want to learn more about the world around you and you start venturing into the unknown, only to find that you might be the only survivor of a zombie apocalypse. You encounter the undead, but you still want to fight back and survive this hell, but you have no weapons, no food nor anything else. What choice do you have? Simple: you create what you need from what you can find. 7 Days to Die has got to be one of the most accurate representation of a zombie apocalypse: with no help whatsoever, players will have to survive for days by any means necessary. While the premise is really interesting, the actual execution of these concepts leaves something to be desired. Even before starting the game, it’s clear how The Fun Pimps wanted players to have as many options as possible in 7 Days to Die. In both single player and multiplayer modes, the game includes a vast array of customization options, which allow players to choose between a crafted campaign or a fully randomized one, tweak enemy aggression, daylight total hours, enemy spawning rate, length of each day in real time minutes and much more. All these options, coupled with several different biomes, allow players to have a slightly different experience every time they start a new campaign. Tweaking these options is also quite important for complete newbies, as 7 Days to Die isn’t exactly s welcoming game for those roaming these undead infested lands for the first time. 7 Days to Die is a first person survival horror game at heart, enriched by role playing game elements and crafting mechanics, which are both fundamental to survive for as long as possible. The open world nature of 7 Days to Die and its crafting mechanics do give players limitless possibilities, but the game doesn’t do a good enough job in explaining them fully. While there are a few beginner quests that can help players find their way through the myriad of available options, it’s very easy to feel overwhelmed by the amount of possibilities offered from the get-go, forcing players to seek out help outside of the game itself. After players have managed to grasp some of the basics of the game, 7 Days to Die starts opening up considerably. In the game, pretty much any element can be interacted with to gather resources, from the most basic plant fiber, stone and wood, to more advanced resources. Players can try to harvest and gather them slowly by using their bare hands, or can craft a variety of tools which can make the whole process much smoother. Crafting also comes into play in other situations, as players will also have to take into account keeping themselves fed appropriately and keeping in good health. If players neglect their health, it won’t take much for the undead to take their life. While gathering the necessary resources and creating the needed items, time will obviously pass, and it won’t take long for players to have to live through their frightful first night. During nights, not only players will have to make do with no natural light, but they’ll also have to contend with stronger enemies. Not that they’re easy to deal with in daylight: zombies in 7 Days to Die are incredibly strong, and quite difficult to take down. Combat is also far from satisfying, so creating shelters or reinforcing abandoned houses is always the best way to go in most cases. Playing 7 Days to Die means you’ll have to deal with all these mechanics at once, and this can be quite overwhelming, as already mentioned, but those who manage to stick with it are rewarded with an experience that’s like very little else, with offline co-op and online multiplayer making the experience even more fun. Unfortunately, it’s unlikely that many will do so, as there are several serious issues, outside the unsatisfying combat, that damage the experience. The most serious issues come from the interface, which is a true nightmare to navigate, with simple functions requiring too many button presses. A cursor controlled with the left analogue stick is meant to simulate a mouse cursor, but it only manages to make the interface even more annoying on PlayStation 4. There are some shortcuts that slightly improve things, but they’re too little to salvage the interface. The game also suffers from a variety of other technical issues, including a weird freezing issue which completely stops the action for a couple of seconds, stuttering and frame rate drops, and even crashes, which result in lost progress. Presentation doesn’t help much as well. 7 Days to Die generally doesn’t look good at all, with low quality models, textures and lighting, and stiff animations giving the game a very unpolished feel. The soundtrack is also almost non-existent with very little music and generic sound effects. It’s clear from this how the team was forced to focus on the actual gameplay due to the limited budget, but a better presentation would have done wonders in making some look past the horrid interface and some other minor issues. Everything considered, 7 Days to Die fails to live up to its potential. The game includes a lot of very interesting ideas, but the whole experience could have done with a bit more polish, an adequate interface and a stronger focus. While the overwhelming amount of elements and mechanics can be conquered over time, no amount of patience will make most players look past the horrible interface and the technical issues, which end up damaging the experience a lot. The undead have won, this time. 7 Days to Die features a very interesting mix of role playing games and survival games mechanics, with customization possibilities and multiplayer features deepening the experience considerably. Sadly, everything is damaged by the horrible interface and menu system, a sub-par presentation, some serious technical issues and a general lack of focus. The "make as you go" type of experience offered by 7 Days to Die is definitely intriguing, but when you're fighting the menus more than the undead, something must have gone terribly wrong along the way.